Although " Yatate (矢立) " was only a pencil case for ninjas, yatate can be said to be the tool which embodied the identity of the ninja. It meant that yatate was often used as an equipment camouflaged by a gun, sword or blowgun. 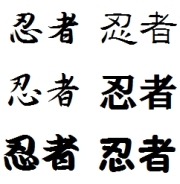 At a glance, the shape of yatate is really simple. It is a pipe with a length of about 300mm and on the top of the pipe, a small box is attached in which ink is put. In the pipe body, some writing brushes and chalk called " Sekihitsu (石筆) " are contained. Sekihitsu is one of the " Shinobi-Rokugu (忍び六具) ", which means the 6 necessities of ninjas. Ninjas memorized important information with sekihitsu and wrote significant messages as codes on the ground or roadside for their companions. Inside the yatate various weapons were kept. The reason was of course that the yatate didn’t seem like anything more than a simple pen case. Because they were inconspicuous, targets for ninjas were unsuspecting and this was what allowed ninjas to strike by surprise. The size of yatate was very suitable for concealing small weapons like a short sword, a bullet or a needle. The first example is a tricky short sword called " Shikomi-gatana (仕込み刀) " , the half which was the top side of the Yatate-body was the case cover. By taking off the cover, a blade appeared. As ninjas got close to their enemies, ninjas would suddenly draw their sword and stab them. Another usage was a one-shot gun called " Nigiri-teppo (握り鉄砲) ", ninjas would shoot it at their targets at point‐blank range. It was perhaps very easy for ninjas to approach their enemies, because ninjas must have been disguised as someone like a merchant or a samurai. 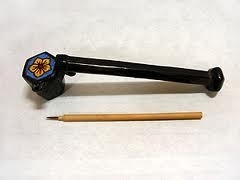 Another yatate was a blowgun called " Shikomi-fukiya (仕込み吹き矢) ", inside the yatate a tiny needle painted with poison was set. Ninjas would remove the top of the yatate which was an ink box. Naturally, on both ends of the yatate, there were two holes, one was for blowing on and the other was an outlet for the poisonous needle . Ninjas could hit their targets with the needle easily from a very close distance. It is the characteristic of ninja tools that a simple one is very profound.